Temperature/Humidity Version also Available - Click Here! Pressure Version also Available - Click Here! 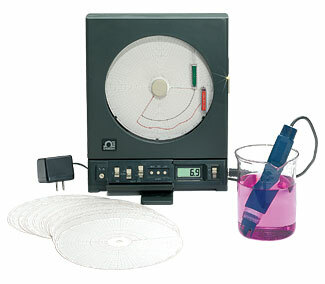 The CTPH is a cost effective recorder for pH and temperature, ideal for facilities required to maintain a record of pH. pH range is 0.2 to 12.0 with Automatic Temperature Compensation, using a unique, electronically amplified probe that provides pH and temperature input to the recorder unit through a 6-pin Mini DIN connector. 참고: Comes in a charcoal gray color, with detachable solid state pH/temperature sensor, additional 6 ft. extension cable, 120 double-sided charts (40 each of 1,7,32 Day), two sets of pens, wall mount template and hardware, 110 or 220 Vac adaptor, chart lights, 4 “D” alkaline batteries and complete operator’s manual. Using the BNC adapter, CTPH-BNC, the ATC is disabled and any low cost pH sensor can be employed, like laboratory type PHE-4202.